There are several ways for you to visit the beautiful campus of the University of Pittsburgh. 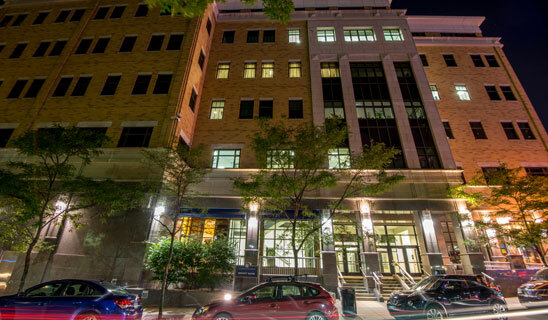 Sennott Square, located on Forbes Avenue, is the home of Pitt Business and is where you will attend the majority of your classes as a business student. Prospective freshmen can attend a Pitt Business Information Session on Mondays, Thursdays, and Fridays at 1:30 p.m. in 2100 Sennott Square. Register online at oafa.pitt.edu/visit. Learn how Pitt Business takes students From the Classroom, To the City, To the World. The session will focus on academic programs, experience-based learning opportunities, internships, career development, student life, global options, and more. If you prefer to visit on another weekday, you can call 412-383-9600 or email admissions@business.pitt.edu. Schedule a meeting to talk with a Pitt Business admissions representative about the transfer application process, including an unofficial credit evaluation. Schedule a meeting by calling 412-383-9600 or email admissions@business.pitt.edu. Pitt visit options include daily walking tours of Pitt’s campus led by experienced student guides and admissions sessions from Pitt’s Office of Admissions and Financial Aid on both weekdays and weekends. Can’t make it to campus? View our virtual tour to view of all of the amenities at Sennott Square and a bird’s eye view from the sky of Pitt’s whole campus.